Thank God for good endings, otherwise I’d be kicking myself for reading this one. In the end I ended up nearly loving it, but it wasn’t until the last third of the book that I found myself fully engaged in the story and characters. So what began as a ‘Hunger Games’ de-ja-vu kind of read, did turn into a unique and (dare I say it?) riveting story towards the wee end. Heck, I may even read the sequel too. The first third of this book sets up the world building and introduces us to the many characters living in a dark futuristic Chicago where factions control peoples actions and beliefs. 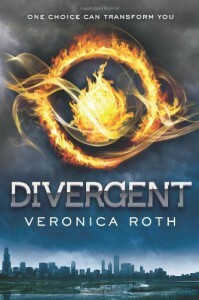 We discover that 16 year old Beatrice is a Divergent -- a person who has personality traits from all the factions. And this is a bad thing. Bad, bad, bad. Sadly, I don’t know why it is bad, or why I should care. Honestly, don’t know. The middle of the book we spend a lot of time reading about the characters while they go through a rigorous boot camp training that transforms people into drones for their new faction. Beatrice/Triss learns to dress trampy, fight like an action hero, inks herself up with some tattoos, and get a big ol’ boy crush on a hot and mysterious 18 y/o trainer named Four. We learn who the good and bad people are now, and a mysterious plot starts to unfold. We also begin to understand why being a Divergent is so dangerous for Triss. And while I’m still not sure why I should care about these people, the story is now getting interesting. The last part of the book is where it finally all gels together, the plot thickens, and several unpredictable twists of events has me glued to the rest of this book. Surprisingly this was not a simple good vs. evil type story, as it actually had layers and layers of well-developed plot. I just didn’t see it coming until the final third of the book. So now I not only like Triss, I love Triss. I get her, and hope her crush on Four turns into something great for her. Because I now care! Yes, I now care about these people. Whew.